RNA Sequencing (RNA-Seq) is a powerful innovation that has revolutionized functional biology exploration in the 21st century. With this technology, it has become popssible to capture an “expression snapshot” for every gene at any desired moment on sequence level mapped to transcriptome scale. A collection of these snapshots enables the comparison of global changes on every observable gene expression in a living being across predefined parameters, such as knockouts vs wild type, different time points of development, various treatment regime of a drug candidate, samples collected at different temperatures; and the list can be as long as our imagination reaches to and is only limited by practical methods available in collecting sufficient amount of samples for analysis. RNA Seq generates vast amount of information. One finished RNA Seq experiment may not be the end of a project. When done right, the vast amount of data could be a reference, a blue print and a long lasting preserved puzzle piece important for the understanding of a biological system in the years to come. To do it right, RNA Seq experiment has to be designed and executived carefully from the beginning to the end. 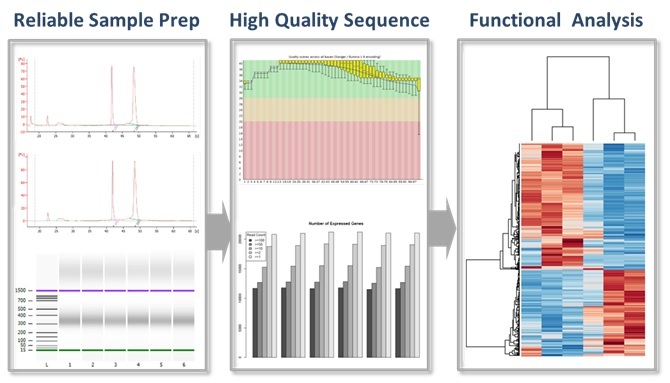 The goal of our CT-Star RNA Seq Full Workflow Service is to help get your RNA Seq experiment done “right”. Contact us today to start your next RNA Seq experiment “right”! Need a reference for our service? Call us (608-886-6718) today!